Newscasters the world over may be quaking in their boots today following the unveiling in Japan of the first ever news-reading android. Actually, having seen the robot in action, there really is no need for any quaking. Kodomoroid (‘Childroid’) was shown off at Tokyo’s National Museum of Emerging Science and Innovation on Tuesday as part of an exhibition examining the relationship between robots and humans. 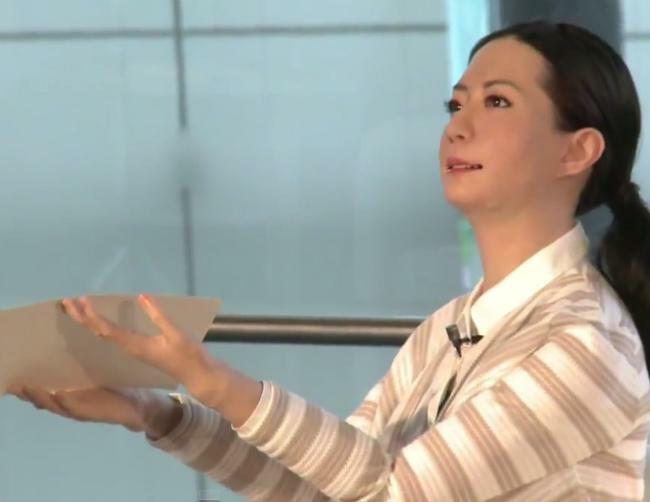 Together with another android called Otonaroid (‘Adultroid’), the pair were shown off by Professor Hiroshi Ishiguro, director of the Intelligent Robotics Laboratory at the Osaka University Graduate School of Engineering Science. Demonstrating her abilities (video below), Kodomoroid was able to deliver gloomy news without unnecessary fuss or emotion, just as you’d expect with real newscasters. However, she also delivered it without much facial movement, leaving her looking like a ventriloquist without a dummy. As for her body movements, it seemed as if she might’ve put her back out shortly before delivering the bulletin. While at the museum, Kodomoroid and Otonaroid will also interact with visitors to help Ishiguro gather data for a study looking at how humans deal with and respond to robots. “This will give us important feedback as we explore the question of what is human,” Ishiguro said at Tuesday’s event. The Osaka professor has been developing androids for the last 20 years and is keen to see the technology used in a wider range of roles in the future. He’s even built one to look exactly like himself, and occasionally sends it overseas to deliver lectures. “It cuts down on business trips,” he quipped to reporters at the museum. Ishiguro also hit the headlines a couple of years back with his lifelike robotic mannequin that he placed in the window of a Tokyo department store. His moving mannequin could pull more than 60 different facial expressions and left some passing shoppers wondering if it was actually a real person.